Time for another road trip out to view the fall colors. 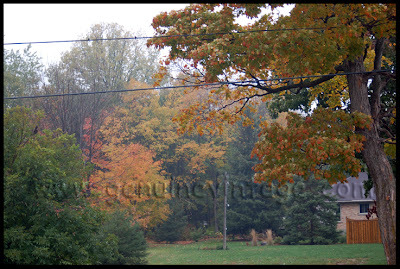 We picked a great day, all cloudy and foggy, and probably still a little too early in the season. We started with a trip to Southworks Antique Mall in Cambridge. 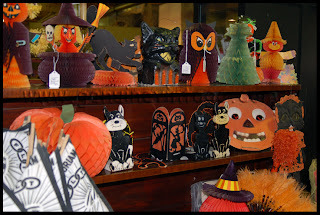 The usual assortment of stuff, always a well varied selection, including dealers with seasonal spooky Hallowe'en treasures. While still in Cambridge though, we found another shop: Greenspot Antiques which is chock full. Of stuff. Of all descriptions but their strong point, indeed, specialty, is miniatures. Now usually, when I see miniatures or so called salesman's samples, my gag reflex kicks in. Usually they're godawful and cheesy. But these at Greenspot Antiques in Cambridge, truly are wonderful. 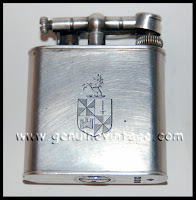 I even managed to buy something: a great old silver, crested, Dunhill lighter. Working! Not a miniature, but one to fit my manly hand. And off to St. Jacobs. This is tourist/Mennonite country and this is definitely where cute comes to die. Bought a couple of things and now, food! We stopped at the Farmers Market (only open Thursdays and Saturdays I think), for quick snoop and had an Oktoberfest (naturally) sausage while P had the apple fritters. They also had the largest supply of Crocs I've ever seen in one location, so I bought bright yellow ones. Had to. Couldn't help it. May have to go back for more. And now into downtown bustling St. Jacobs. Okay it usually is bustling, but today it was raining. No too much bustle. 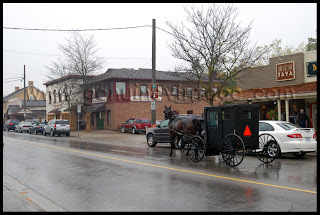 It really is quaint in that demeaning way that city people have of phrasing things and they have lots of visitors and tourists taking snaps of all things adorable so I suppose the St Jacobs Antique Mall has a reason for their attitude. And it's not just an isolated experience, I've noticed it before on previous trips: no dealer discounts, no public washrooms, staff that seems bothered by you. I just kinda get the feeling that they'd be much happier not having to deal with the public at all. Where the attitude seems to be: "This would be a great place to work except for the customers always bothering us and wrecking the displays. Just send us your money and stay home." I used say that I wasn't in the antiques business, I was in the tourist souvenir business. So If you're going to run a business that's in an environment that depends on tourism for its livelihood, put in a damn toilet that's open to public. I know people can be pigs and there'll be work to keep it clean. Get over it. When I was set up at the Toronto Antique Centre I intentionally picked the spot next to the toilets as my location. It was good for business: people had to get by me twice, coming and going; I had two extra chances at showing the merch. And it worked. People who perhaps had come to see one dealer in particular and hadn't planned on looking through the building, still ended up at my shop. Nick Graham founded Joe Boxer on this philosophy: The Brand is the amusement park, the product is the souvenir. And the more fun a tourist/visitor/potential customer has, the more likely they are to take a souvenir home with them, whether it's a piece of antique jewellery or a two old crows garden decoration. And it's no fun having to find a washroom. A few other shops have a "no washroom" policy as well. I can understand it if you're a little mom and pop shop, but if you've got multiple staff, you should have a toilet open to the public. The city should have something available. It may have been but I just didn't see any signs. And another thing while I'm ranting. I'd picked up a pamphlet at the Antiques Warehouse showing their two other locations: one in Elora, another in Stratford. Elora is sorta close and kinda on the way back to Toronto so, armed with the map on the pamplet, off we go. I may be directionally challenged, cartologically challenged, numerically challenged, but folks when I have an address, I can usually get there. An hour later we're still driving in circles. And we start channeling the Bickersons. When I got home and checked the website, it seems that there's only two locations now. We were driving around, going nuts, having a marital discord moment, looking for something that wasn't there. Antique Warehouse people, listen up! Print new pamphlets! Or put stickers on your old ones. Have signs on your pamphlet rack or on your damn doors or something. My, aren't the leaves pretty.